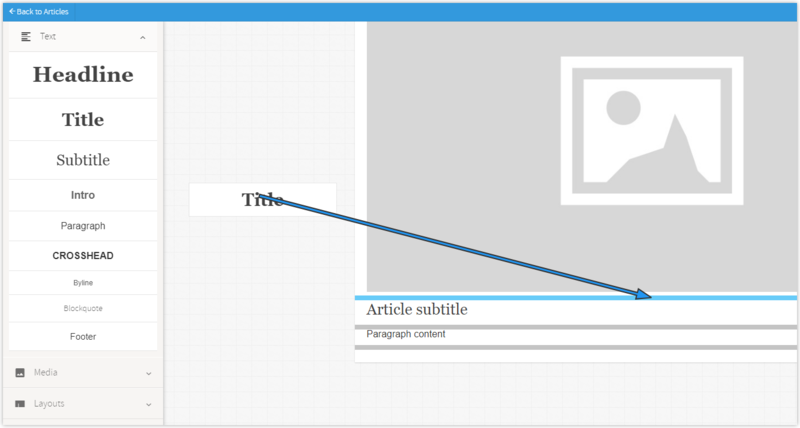 Canvasflow offers a full drag and drop interface making it easy to add new components to an article or template. A component can range from a simple text block, to rich media elements and even more complex structural layouts including columns and dividers. There is no limit to the number of components that can be added to an article and the canvas will automatically expand to accommodate each new component. From the component panel, click the component type heading you would like to add. This will display the available components for this component type. Find the component that you wish to add. Click and drag the component on to the canvas. As the component is moved, all valid drop zones will become highlighted to indicate where the component is eligible to be placed. As the component is moved closer to a drop zone, an arrow will be displayed indicating where the component will be placed if dropped. Release the mouse button to place the component in the desired location. The component will appear in the selected location.